Apr-May 2016 - WoTTA forms and hears varying complaints of ASB around the town and little action taken by police or consequence to offenders. This appears to be worsening. Adversely police state very few crimes are reported. 5th May 2017 - WoTTA leads a visual audit of the town with EBC, police & local Councillors. Nothing has improved in the past year. The PSPO has been in place since February 2018. It was initially organised to run for a 12 month period. EBC and the police are now gathering feedback and making a decision as to whether the time period should be extended for a further 24 months. To that end WoTTA organised a meeting for local businesses and residents groups to report their feedback to the police, held in McDonald's offices. They also helped police collect statements from businesses unable to attend. The feedback was overwhelmingly in favour of extending the PSPO with reports across the board of reductions in ASB since it came into force. No one present wanted to lose the momentum we have gained in the past 12 months and potentially revert to the extensive problems we were seeing at that time. EBC will send out letters to all residences inside the PSPO area asking for feedback. February 2018 - Public Space Protection Order Starts! November 2017 - Public consultation survey re Public Space Protection Order planned for Walton-on-Thames is now live! Following on from our successful campaign to stop ASB in Walton, EBC have now launched their public consultation on the proposed PSPO. As many people as possible need to complete this very short survey. Please pass this on to others. Residents and businesses have an opportunity to respond to a consultation regarding a Public Spaces Protection Order in Walton Town Centre. From the beginning of 2017, Surrey Police has received numerous reports regarding anti-social behaviour in Walton-on-Thames Town Centre. It has been reported that there is evidence of substance misuse, underage drinking, and sexual activity where these groups have been gathering, which has led to assaults, criminal damage and racially motivated crime and robbery for example. As a result, Elmbridge Borough Council is considering a Public Spaces Protection Order (PSPO) for a specified area of Walton-on-Thames as this behaviour is having or is likely to have a detrimental effect on those living in that area. Part of the process for implementing a PSPO requires public consultation on the proposed restrictions and requirements. The responses from this consultation, along with other evidence, will be considered by Cabinet and Council in the New Year. The consultation on the PSPO will be open between 2 November and 3 December 2017. For those who live, work and visit Walton-on-Thames, you can respond using the online survey. Please note, the consultation is subject to a period of extension should it be felt that further evidence is required. Councillor Mary Marshall, Portfolio Holder for Community and Corporate Development says; “Consultation on a PSPO is key and we are encouraging open discussion as part of the consultation process to identify how best to balance the interests of different groups – both those affected by anti-social behaviour and those who will be restricted by the terms of the Order – it is a chance to explore whether there may be unintended consequences from the proposals. We will be consulting with residents, local businesses and landowners as part of the consultation process. Being used as a fly-tipping zone as well as an area where people congregate to drink etc. Wellington Pub looking like it will be developed soon, which might improve the situation. Council to organise a deep clean of the area and to keep a closer eye on it. Everyone agreed there should be more litter bins in the park. In the past the council have said they don’t have money for the revenue costs involved in emptying more bins, but it must cost them more in time) to pay someone to pick up all the litter that is a daily occurrence in the park - mostly around the benches. The cricket club suffers from Friday/Saturday ASB during the entire year, and nightly during the holidays. This Easter activity appears to be reaching the worst levels ever seen. Many appear to be under age and drinking alcohol illegally. The police are planning to target the places suggested as selling this alcohol. 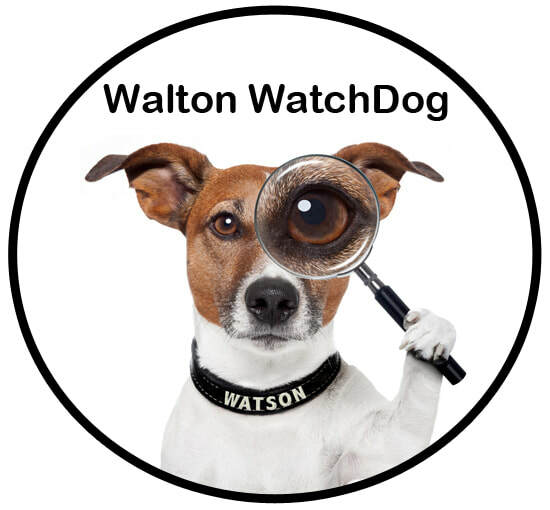 WoTTA, the cricket club and Vision On Systems are promoting Walton Watchdog as an easy alternative for local people to report all types of ASB, on their computer or via their phone. Once reported via the WoTTA website, Vision On will then log these reports on the required council sites, if not already done. They want to build a picture of the town to help get action taken. Walton Cricket Club are very frustrated with the situation and want a clear indication of what will be done to improve it. At present the Youth Centre is not open at the weekends. All agreed it would be a good idea to investigate opening Friday & Saturday evenings, possibly to an over 14 crowd only. In the year since our last ASB tour nothing has been done in this car park and unacceptable behaviour continues, with items being thrown off the car park, people sitting on the dangerously low ledge etc. The council suggested closing the car park at night. This would require a revenue cost to be met by the council to have it open and shut. WoTTA will organise a meeting with the police and local businesses/residents groups/sports groups who are keen to start a dialogue about how to crack down on Walton being perceived as the go-to place for young people to cause trouble. Walton-on-Thames is a lovely place to live. And we'd all like to make sure it stays that way. Unfortunately ASB occurring in the town has been brought to our attention, so on the 18th May 2016 WoTTA met with council representatives, the police, concerned local residents and representatives from Sainsburys, the Princess Alice Charity Shop, Wilko, Homebase, Walton-on-Thames Cricket Club, Honeypot Nursery and McDonalds. Major areas of concern in Walton-on-Thames are the alleyway and area behind the Wellington Pub, Druitts Car Park, and Ashley Park and the Cricket Club, although ASB is also occurring in Sainsburys, Starbucks, McDonalds and along the Homebase border. The situation at both Druitts Car Park and the Cricket Club has become unacceptable and action needs to be taken immediately. After a three hour discussion and walk about the town, it was concluded that it is necessary to get a body of evidence together to ensure action will be taken at the council and police level. Some people have given up reporting incidents to the 101 number as they haven’t seen any action from their reports, or can’t get through. At present an incident needs to be reported to the police and the council separately. A solution was suggested in the form of Facewatch - an online initiative approved by the Home Office which the whole town can use to report issues, both via the Facewatch website and app. We are actively looking into this. A complimentary option is to also get the police to create a Niche Report - a multi-agency working document logging all incident reports. Installing two gates at Druitts Car Park. If you'd like to join our ASB committee, whether a trader or concerned resident, please contact us. And please feel free to send us your comments on ASB in Walton.